You keep some strange things in your pockets. hen I played the first chapter of this game, I was worried. The concept of episodic content seemed flawed in some way, but looking back I think my assumption had more to do with some developers' inabilities to actually produce the promised content. But with Tales of Monkey Island, I feel the process is nearly perfected. The amount of fun and entertainment that exists in a chapter feels right. It can last you a few hours or maybe days depending on the amount of mental grinding you put towards it. And the story itself fits so neatly within each episode, much like your favorite television program. I think for this genre, episodic content just works. And the wait isn't so terribly long either. By the time I wonder if another chapter is out — a link arrives in my inbox. Like Pinocchio and Marcus Fenix before him, Guybrush Threepwood must escape a rather enormous creature.It took three chapters for me to appreciate receiving periodic experiences, two for me to fall in love with the story, and only one to go all-out Monkey Island fangirl. The chapter itself, Lair of the Leviathan, is rather . . . unforgettable. 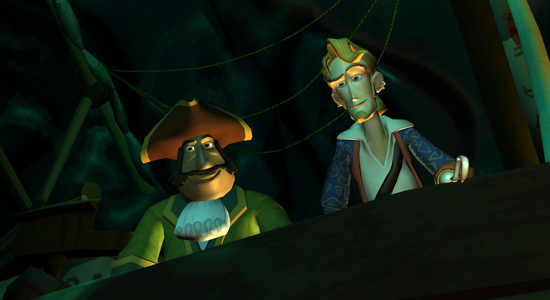 Like Pinocchio and Marcus Fenix before him, Guybrush Threepwood must escape a rather enormous creature — from the inside out. But fortunately the levels are not nearly realistic enough to trigger the 'ol gag reflex. Well, that isn't entirely true. I found a couple sound effects to be particularly disgusting, but I suppose that is all part of the experience when trapped inside an animals innards. Since I am in no way an expert in this particular franchise, it should be known that I read up on some of the more memorable experiences in the series. One that stood out the most was, naturally, the legendary Insult Swordfight. I heard so much about it, but never had I experienced the like, even in the previous chapters of Tales of Monkey Island. That is, until now. At one point in the game, Guybrush is challenged to a Pirate Face-Off. He must literally make the most hideous, frightening pirate face he can muster, but not without inspiration. Some are downright silly whereas others seem to channel the spirit of the late Jack Elam. This episode was injected with more humor than usual, if you can imagine such a thing.But the most challenging task came when Guybrush had made his . . . exit, and was then sequestered into helping this creature in wooing his female counterpart who was grumpy at the time. Difficult and frustrating, but all the same it was incredibly fun to figure out how to deliver the appropriate answers based on her leads. If I could choose a favorite puzzle thus far, it would be this one. This chapter was the most fun as it seems to be injected with more humor than usual, if you can imagine such a thing. Oh, and I almost forgot the special "friend" who makes an appearance. Old fans of Monkey Island will be incredibly pleased. And if you happen to play this game, watch the credits! There is so much I want to say about this game, but it would simply spoil the entire story. So I will tease you with this — play this game if you love possessing others, selling fine leather jackets, sliding down intestinal tracts, hexing intolerable scientists, drinking bile — I mean ichor, cutting throats, and dehanditating, the Bugged Out Lazy-Eyed Meanie, or just being a mighty pirate who does piratey-like stuff. That last one is reason enough in my book. And at least the Face Off was far better than Monkey Fu from Escape From Monkey Island. I thought that was pretty hilarious. Haha, me, too! I even sat through the WHOLE CREDITS just to hear what he was going to say. What kind of potential does this series have for extension into television or film? Seriously. I want to play chapter 4 and 5 right now!